Did you know that there are 3 cities with events this month all over the world? To include your event contact us! Problems? Ideas? Need more Information? Send us a message! 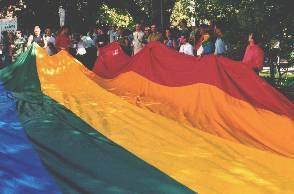 Several organizations have organized and/or participated in Pride events in Portugal. Find more about them here. Promote this website in your page. You too can help this events, take a look and find out! More than 100 pride events all over the world. 13 to 28 September - An GLBT Film Festival recognized around the world. 12 August - A pioneer initiative in the Algarve region with about 700 participants. 27 July - With more than 80'000 participants, Elektro Parade + Elektro Festival counted also with about 20 sound trucks, one of them GLBT. 20 July - In the city of Leiria the second edition of this street party. 12 July - Already a tradition in Póvoa de Varzim, an organization ILGA Portugal. 29 June - The Pride March took place for the first time in Avenida da Liberdade (the main city artery) with a new visibility to this event. Saturday, 7 July 2001 - The biggest ever GLBTH event in Porto. Information and Photos. 22 - 30 June 2001 - Information and Photos. Saturday, 30 June 2001 - Information and Photos. Saturday, 30 June 2001 - The GLBT outdoors party where everyone is welcome. Information and Photos. 1 July 20:00, Lisbon - Information and Photos. 1 July 17:00, Lisbon - Photos. 24 June - 1 July, 2000, Lisbon. Information and Photos.